Laura Lee began her cosmetology training in 2000 in Europe and licensed in the United States in 2004. Weddings, formal hair and updos have been her passion since she began doing hair. She has taken continuing education classes in London, New York, California and Florida. She worked in a Bumble and Bumble Network Salon on Royal Caribbean Serenade of the Seas, as well as many other salons providing styling for formal events and weddings. Laura has also provided onsite styling for fashion shows, theatre performances and numerous weddings. Christina has been a makeup artist for over 15 years. She is originally from New York, which is where she started doing theatre. She studied Theatre at Flagler College in St. Augustine, FL and went on to receive her MA in Media Studies for Film and Television from the Univ. of London, UK. She has worked with production companies on commercial, industrial, and training shoots, and has also worked with several cosmetic companies including Christian Dior, Laura Mercier, Lancôme, and Benefit. 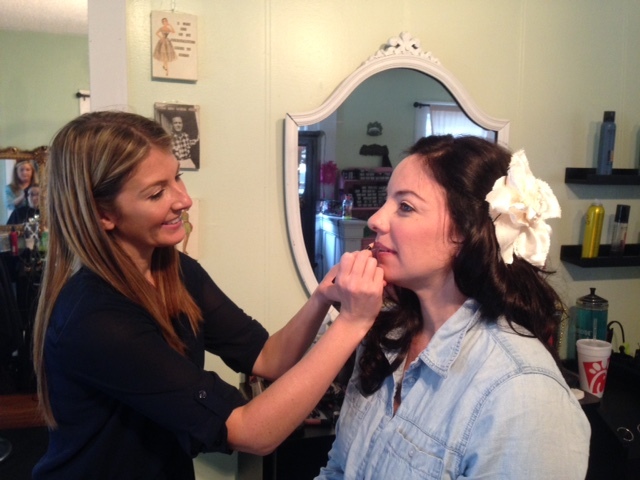 Christina specializes in natural photo-friendly makeup, which is a perfect fit for brides who want to look timeless on their big day. 5 star Super nice, easy to work with, and she made me and my bridesmaids look breathtaking! circumstances. She was delightful to work with, very upbeat, but calming on that most hectic day. And the makeup – wow! All women should be made to feel that beautiful on their wedding day! All of the tones were nothing short of perfect, but the makeup was very light.